Tired of failing miserably at every diet you try? Everyone wants to shed those extra few pounds that they gained during the festivals. But those hours at the gym don’t seem to be paying off and the bulging waistline is an ever growing concern. Well, here is a diet plan that just might be right for you.This plan eliminates fat, proteins and unwanted carbohydrates from your daily intake for duration of seven days. It limits your diet to low calorie fruits and vegetables. It also reduces serum cholesterol levels. All this in just seven days! 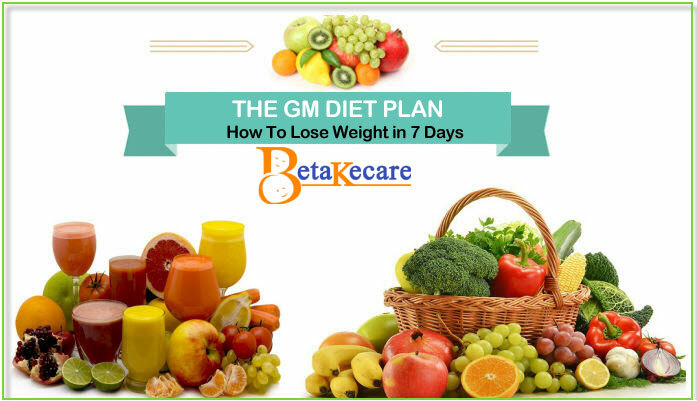 Gm diet was believed to be created in 1985 by the General Motors, along with the Food and Drug Administration and the United States Department of Agriculture, for its employees. It was designed to help employees get in shape and to increase work productivity. This diet showed great results within in a week and gave the employees a boost of confidence. Millions of people, who want to shed those extra few kilos, swear by this diet as it does not compromise their routine and is easy to follow. You can eat every fruit in good quantity except bananas as they are rich in carbohydrates and potassium. Water intake should be about 8-10 glasses for the day. A good strategy would be to involve fruits with a varied range of vitamins that are high in fiber. Take care not to consume anything but fruits for the day. Keep active by doing basic exercises like walking, running or yoga. Bear in mind that as you are only on a fruit diet, you should not take up any rigorous exercises. Cooked/uncooked vegetables without oil and fat. After the first low carb day, this will replenish your carbohydrate requirements and will energize you for the next day of the diet. Avoid cooking these vegetables in oil or butter. Steamed and boiled are the best and the most effective options. Dairy products and beverages are also on the list of things that you need to avoid. Drink 8-10 glasses of water and keep your exercising to a minimum. Stick to basic stretching routines. Day 3 is the combination of fruits and vegetables. All fruits except bananas. This combination will ensure a higher fiber and nutrient intake. Drinking 8-10 glasses of water will flush out the toxins out of your system. Try a few squats and lunges to keep you active. Make sure to avoid the food that is not on the prescribed list as it may hinder weight loss. 8-10 bananas and 4 glasses of milk should make up the three meals of your day. Consume a big glass of milk along with a banana or two for every meal. Bananas are rich in carbohydrates and milk and will fulfil your protein requirements. You can substitute figs for bananas if it is not your cup of tea. Keep in mind that adding other snacks to your diet is prohibited and may mess with your diet plan. Non vegetarians can opt for lean protein like beef or skinless steamed chicken and vegetarians can go for a cup or brown rice. Baked, cooked or raw tomatoes are the best options. Chicken and beef is rich in omega-3 oils and tomatoes help in digestion. Increase your water intake to 12-15 glasses of water to avoid excess uric acid creation in your stomach. Exercise moderately to avoid losing muscle mass and build energy. Vegetables have to be boiled or steamed and not fried. You could include salads, but avoid having heavy dressings. Non vegetarians can add lean beef or skinless chicken to their meal up to 500grams. Exercise moderately and drink 8-10 glasses of water. Include as many vegetables as you can with the bowl of rice. Packaged fruit juices have a lot of added sugar. So opt for fresh fruit juices and try to avoid anything packed or processed. Drink water and juices to cleanse your system. By the end of the 7th day you must have noticed a considerable amount of weight loss, if you follow the diet word to word. If you love Indian food, this is just the recipe for you. Mixed Sprouts and Corn work really well together make a filling dish that also helps in losing weight. This recipe works well if you are on the GM Diet. Cook the sprouts in the water till tender. Add the boiled corn and mix it well. Keep this aside. For the dressing mix together ginger, salt, pepper powder, honey and lemon juice. Before serving mix the corn, sprouts mixture with the dressing. Garnish with coriander and coconut. A good soup is a staple of every diet. Get creative with soups and add seasonings that you prefer and enjoy. While doing so, make sure that the ingredients are in the list of items allowed for that day. Chop up the onions and peppers. In a pot, toss them in olive oil gently, till they turn mild brown. Next, mix the cut tomatoes, celery, and cabbage in the pot along with the water. The soup takes about 60 minutes to cook. After the vegetables boilleave it to simmer. Season it with pepper and salt and enjoy a bowl of delicious soup. This diet will help you lose maximum weight within a week. It helps flush out toxins from your body. Since most part of the diet consists of fruits and vegetables, it will help you to develop a good digestive system. You should exercise regularly, as the diet would leave you tired and weak. Through routine exercises each day, the body’s metabolism would speed up and help support your body through the process. Not everyone can follow this diet. Depending on your body type and the ailments you have, you may need to consult your doctor before starting this diet. Cheat days are not allowed. If you decide to skip a day or two and continue after an interval, chances are that you might end up gaining weight rather than losing it. If you are pregnant, then please consult a doctor before taking up this diet. Once the diet ends make sure to eat right. Going back to packed and processed food will only make you put on those kilos again. Continuing the diet after the 7 days is not advisable. Doing so may cause several side effects. This diet, if followed through, may give great results for people of all ages. At the end of this process, your metabolism will get a good boost and you will be a little lighter on your feet. So just keep the tips in mind and give this diet a try!